Today someone wrote in saying she didn’t think she was worthy to be ordained. She is basically already working as clergy in her community, she just lacks legal ordination. Yet she feels “unworthy” and full of flaws. I explained to her how much the country (and the world) needs alternative clergy like her, and that there is no place for self-guilt-tripping when we have much work to do, many souls to care for! 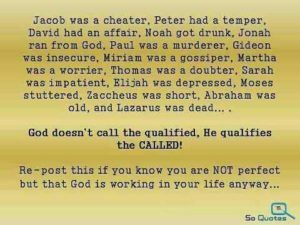 Then I directed her to the old saying “God doesn’t call the qualified, he qualifies the Called” and the image (see below) someone posted to our forum several years ago. If you feel called to become a Minister, Rabbi, Chaplain, or even a Priest with Apostolic Succession, NOW is the time. This entry was posted in Become Ordained, Clergy Skills / Pastoral Care and tagged ordained, ordination on February 17, 2017 by admin. I wish to update my bio on the directory. I am now the Rabbi and Spiritual Leader of Beit Chaverim, the Jewish Community of Southern Utah. I am also the Vice President of the Interfaith Council of St. George, Utah. Thank you in advance for making these changes to my bio on the directory of clergy. 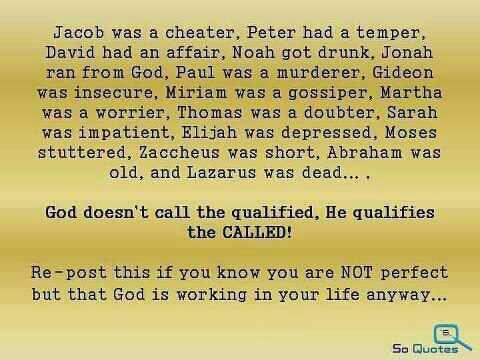 I want to be a Ordained Minister!